The first size introduced into the Nouvelle Candle line in 2001, the Large Signature Glass is still the best selling size to date. Box packaging is a two-piece cream over bronze, accented by a copper fragrance label. Each glass jar is emblazoned with the Nouvelle logo along with the name of the candle scent. Wax color may vary slightly from image shown. With this fragrance, Nouvelle embraces their home state of Louisiana and its vast fields of sugarcane, rippling and trembling in the breezes of late summer. Enjoy the natural sweetness of this fragrance, and be transported to the land of cane fields and bayous. A glorious pairing of soothing red ginger, anchored by the herbal earthiness of Moncorvo hemp. Languid and seductive. The perfect alliance of invigorating sea salt and exuberant lemon, with notes of basil, finished with a light brush of orange and eucalyptus. This tranquil aroma transports the senses to languid afternoons spent at water's edge. Clean and subtle. *Nouvelle Candle's BEST SELLING fragrance! Narcotic in its allure, a landmark in southern landscapes for centuries. This unique intermingling of white honeysuckle, light citrus, and exotic green wood is truly captivating. Ripe, luscious ruby red grapefruit blended with the tartness of blackberry and currant. A perennial best seller. A tribute to the independent woman. Asiatic patchouli blended with rich chocolate finished with a hint of Parisian perfume. Truly exotic. Alluring and historic, this mysterious fragrance is a blend of patchouli, kumquat, and zesty sandalwood. Let this exotic aroma transport your sense to the Vieux Carre! The sharpness of sun-kissed ripe pomegranate peel blended with warm rich amber notes finished with a hint of lime. The dazzling and assertive scent of fresh Paperwhites, accented with soft notes of honey and vanilla. This bold floral with its big fragrance throw is the perfect choice for scenting large spaces. 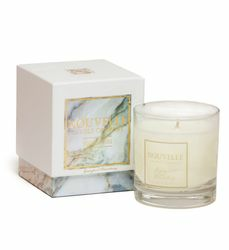 *One of Nouvelle Candle's top two best-selling fragrances. The tartness of black currant combined with cassis create this truly unusual fragrance. Completed with sparkling notes of lime.